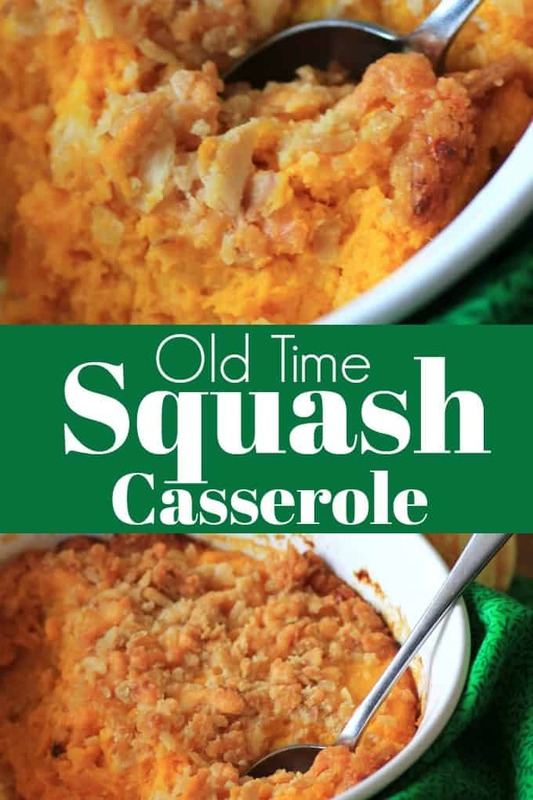 Old Time Squash Casserole is a perfect side dish for the holidays! I have a gorgeous Old Time Squash Casserole for you for your Thanksgiving table. This is a recipe that I loved the second I tried it. This year I have been experimenting with different squash ever since we did Squash Fest for #SundaySupper. I am in love with the Red Kuri squash. There are loads of different squash out there so substitute your favorite. I have always made a sweet squash dish with acorn, like this one, Acorn Squash with Cinnamon and Cranberries. There are several side dishes that are perfect for Thanksgiving and other holidays. With the holidays fast approaching, now is the time to start your planning. 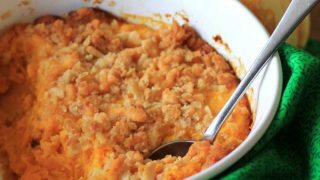 One of our favorite side dishes at any Thanksgiving table is this delicious Old Time Squash Casserole recipe. This savory casserole dish can be made with summer squash, butternut squash or even spaghetti squash. 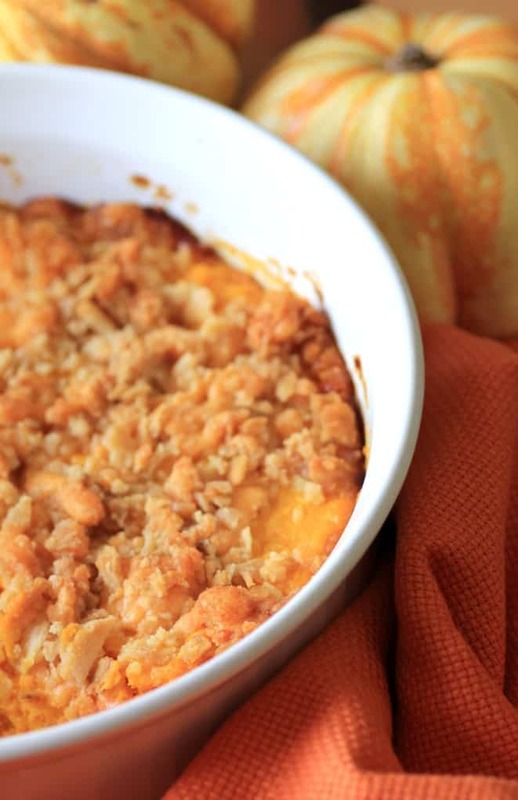 No matter what your squash preference, this delicious combination of cheddar cheese, crushed crackers, melted butter and more, make up the perfect side dish. I really liked this recipe because it is savory. It is light and fluffy with a hint only of garlic and onion. The delicious cheddar cheese shines through and goes so nicely with the squash. Enjoy this recipe for your Thanksgiving or holidays!! 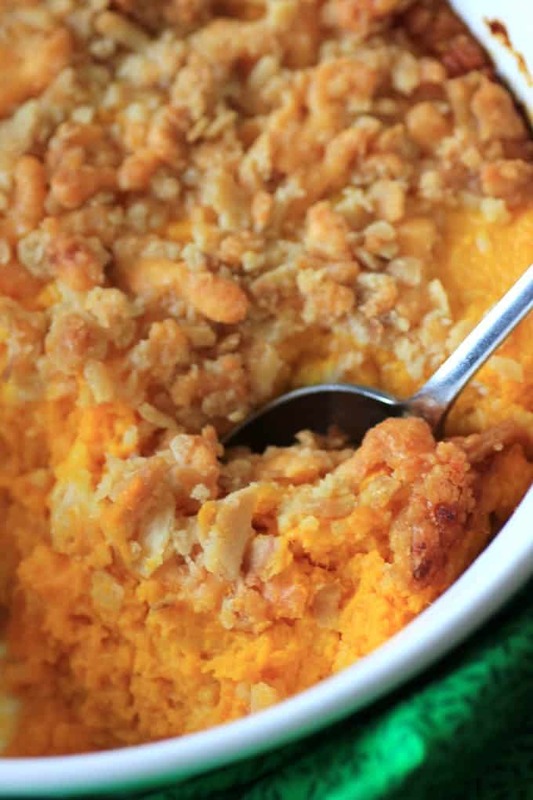 How do you Make Squash Casserole? When you are making a squash casserole, you are going to want to make sure that you find the type of squash that works best for your family. There are several different squashes to choose from, as well as several flavor combinations you can use. 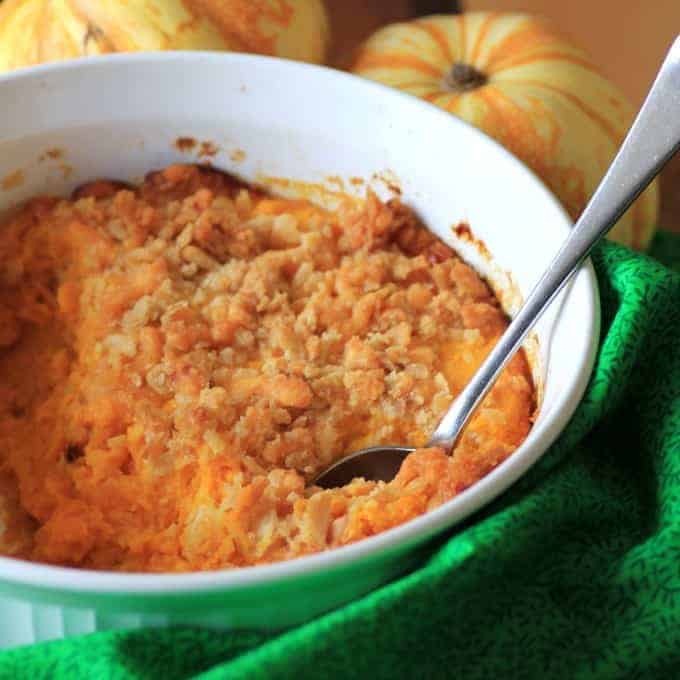 If you are looking for a sweet squash casserole recipe, those are usually made with ingredients like marshmallows, brown sugar and even cinnamon. There are savory squash mixtures out there too, using ingredients such as onions, garlic, and cheese like this recipe. Depending on what flavor profile you choose for your squash casserole, there are several ways to put together a delicious and easy baked squash casserole this year. Check out this CHART to help you choose the perfect squash for your next casserole. This Old-Time Squash Casserole recipe has been a family favorite on our Thanksgiving table for years and we hope it will become a family favorite for you as well. A cheesy savory squash casserole perfect for your Thanksgiving table. Butter a 2-3 quart casserole and set aside. In a large pot add the squash, garlic, onion, salt and water to cover and bring to a boil. Cover the pot and simmer for 20-30 min. until the squash is tender. Remove from heat and drain. Preheat the oven to 350F. Mash the hot squash with the butter. Beat the eggs with the evaporated milk and beat into the squash. Reserve 3 Tbsp. of cheddar cheese. Add the rest of the cheddar cheese and 1/4 cup of the crackers. Melt the last of the 2 Tbsp. of butter and mix with the remaining 1/4 cup of crackers and 3 Tbsp. of cheese. Sprinkle on top of the squash. Bake for 30-35min. or until bubbly and browned. What a great side dish this would make for Thanksgiving and I love the idea of the crunchy cracker topping. I need to try this recipe soon. Thanks so much Janette, we loved it! Another beautiful Thanksgiving recipe Tara! Looks delicious. Gorgeous casserole! I love the topping! I love the red kuri squash. I’ve never used it before, but looks great! I am in love with this squash, it is so good. Thanks Kelly. What’s old is new again. I think taking classic recipes and making them fresh with a new ingredient. I haven’t had a red kuri squash before, but anxious to try it. I am all over this squash this year, just made a soup too using it. YUM!! Thanks Michelle. Question please: I just saw the recipe and haven’t made it yet. Will 1/2 cup of water cover the vegetables ? The recipe called for adding the water to cover. Should I have read add the half cup of water then cover the pot? I took out the 1/2 cup of water as that was confusing. Just cook the veggies covered in water. I’m so glad you Canadians have an earlier Thanksgiving…lots of delicious inspirations for us in the states next month 🙂 Your casserole looks perfect for the holidays. This looks great Tara. I prefer savory squash recipes, so this is right up my alley. This would be a great addition to T-Day. This is something my kids would love. They really enjoy all the fall squash that we get from our CSA. Looking forward to trying it! I hope you do try it, thanks Michelle! Thanksgiving seems to be all about the food for sure!! Thanks Maureen! G’day I love squash casserole and makes me feel like Thanksgiving is all through the year! This is similar to a recipe my family makes. The difference is we do not mash the squash because we use yellow summer squash. Is it possible to use acorn or butternut squash instead of the squash you used? I have not heard of that squash before. Yes, for sure you can use whatver squash you like. I used that one as it was different and really liked it. Enjoy!! I found when making this casserole, that the directions weren’t that easy to follow. I never saw what degree to set the oven to, though I could have missed it. It’s baking at 350, and I’m hoping it’s a lot like the recipe my grandmother used to make. Just thought that the directions could have been a bit more clear. Thanks for sharing this-hope it’s good. How could it fail? Squash, butter eggs and cheese, right? I make almost the same, but I add a small jar of chopped pimentos which gives it a dash of color. Personally I like this one because it is not sweet, a nice change up! I honestly don’t think I would add it to this recipe. If you want to try, add it in with the butter when you are mashing the squash.